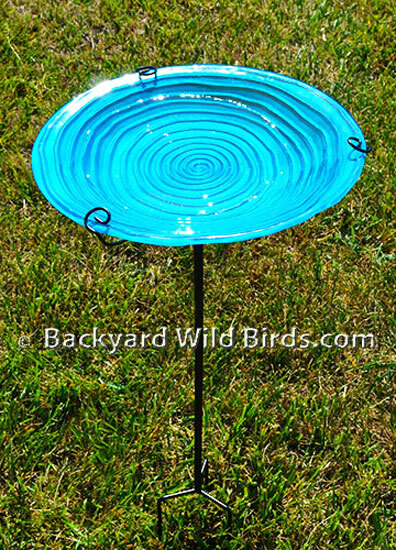 This is a decorative blue swirl glass bird bath that includes a strong metal stand. The blue swirl it produces is truly a beautiful Glass Birdbath. Songbird friendly with textured bottoms and correct depths. 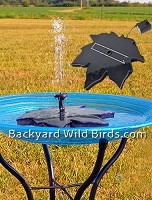 Glass design makes birdbaths cleaning friendly. Attractive enough to display indoors, embossed with gorgeous and vibrant colors. The blue glass feeder is strongly supported on its metal stand. The blue Glass bowl has an 13 inch diameter with curved edges around the bowl. 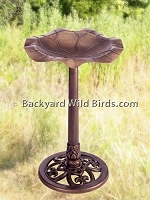 The Glass Bird Bath is like having a work of art that is also functional and easy to maintain. Place anywhere around your home or garden.